A few posts back, I mentioned a test-knit that I was doing for a designer. I fearlessly quote my own blog post below, as I wrote it and gave myself written permission to quote it elsewhere under the Fair Use provision of copyright law. The excerpt is fewer than 50 words, so I should be doubly safe from self-litigation. ... a test knit so hideous that Laptop scuttles out of the room (hissing) whenever I remove the thing from its lightproof bag. To add insult to injury, the supplied yarn's texture rivals that of steel wool, but is not quite as soft. Having placated the copyright cops, I state here, for the comfort of the FTC, that both the pattern and the yarn were given to me. However, neither were gifts, as I must return both the knitted object and the remaining yarn to the designer, for which I will be paid a pittance. I did, however, receive a free copy of the pattern, and this I shall gleefully burn. Aside from the appearance of the thing, which Harry and I agree is the single ugliest knitted work in the history of textiles, the pattern contains several errors. The designer did not respond to my queries, so I assume that the errors are now written in stone printer's ink. It turns out that the pattern is from a book the designer has written, as I discovered on Saturday. I picked up a book at SAFF, and was smacked in the eye by The Ugly Object as I riffled through the pages. It occurred to me that I ought to do a book review, since I have an intimate acquaintance with at least one of the patterns contained therein. I am not, however, going to mention either the book title or the author, lest I be sued for libel. Similarly, I will not be showing you any photographs or quoting content, for fear of breaking copyright law. I am safe from the FTC as well, because I neither bought, nor received the book as a gift, so do not now, nor have I ever, had it in my possession. So, I present to you an FTC/Litigation/Copyright-Safe Book Review. Please feel free to reuse the words here for your own book review. As you will see, my coverage will work for just about any knitting book you dislike, while keeping you out of the courts and the prison system! Furthermore, I give everyone blanket permission to blatantly copy everything written below in perpetuity. Fleegle's Hard-Hitting Review of , by , available from , 2009. The title of this book is very descriptive of the contents, but the designer's taste leaves something to be desired. I've never seen anything quite like these finished objects, which are actually not intrinsically ugly. However, the designer's choices of yarn and color transformed the plebeian patterns into a chaotic visual jumble. The body text font is a very thin, condensed typeface, making it difficult to read and even more difficult to follow the directions. The color plates, paper, and binding are very attractive. Nice job, printers! The book has a table of contents, an index, and a bunch of designs in between. I won't tell you how many there are, because you might figure out which book I am talking about and notify the designer. In turn, the designer would contact a lawyer and I would be sued for libel. Let's just say that there are more than five and fewer than 100. I noted that most of the patterns could be found for free on Ravelry, and would most definitely benefit from your own personal and tasteful choice of color and yarn. I am not going to tell you what kinds of patterns we are talking about, because again, you might guess the book and I would be sued. The patterns are definitely all knitted, most with worsted weight yarn. Some patterns were knitted with other yarns, but I am not going to furnish any more details, except to say that you will need some knitting needles to complete them. A few stitch markers would be a good idea, too. So, to conclude, unless you are a fan of visual hysteria, I discourage you from purchasing this book. And with that, I leave you until next time, when I shall present photographs of an actual finished lacy sweater, knitted and photographed by me, and completed this very day. I rarely comment on news items, but these two blips are beyond ludicrous. The PRS is the British equivalent of the RIAA, who, we assume, will surely adopt these Draconian regulations in an effort to squeeze the last penny out of anyone dumb enough to hum in public. 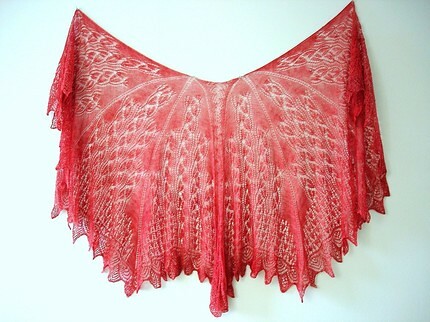 A while back, I posted a pattern link to this lovely shawl (Something Wicked This Way Comes, by Karen Walker). .......I think about knitting the edging in black. Nah. Too abrupt. Then I think about dip-dying it. Nah. Too chancy. Then I think about spinning the yarn and new possibilities present themselves. I finally emailed Anna at Corgi Hill Farm, sent her a picture of the shawl, and explained what I was looking to do. She's brilliant, folks. She carefully dyed a graduated series of silk/merino batts for me that will, after I spin it all up, give me a nice flow from Wicked Red to Wicked Black. I have about 7 ounces of batt, and need about 2200 yards of two-ply, which works out to 314x2=628 yards per ounce. And that, after consulting various tables, is about 80 WPI. Doable, but it's going to take some time. So the only Wickedness you're going to see around here for a while is Harry. Apparently, he had a nice gig at the Two Tables Restaurant in Zanzibar City. Unfortunately, a two-table audience was way too small for his ego, so he's taken some time off to kayak the Zambesi river. 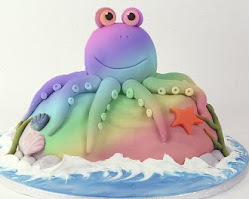 The guides discovered on his first day that Harry's rendition of Moon River caused crocodiles, algae, and hippos to flee from the river at Mach 2. The tour company is trying to sign him to a long-term contract. I personally wrote him a stellar letter of recommendation. It has not been the best of days. The early morning hours were spent writing begging, whining eloquent, pursuasive letters to an assortment of accounting departments that owe me back pay. Having completed this distasteful task, I moved on to the Project of the Day, namely a test knit so hideous that Laptop scuttles out of the room (hissing) whenever I remove the thing from its lightproof bag. To add insult to injury, the supplied yarn's texture rivals that of steel wool, but is not quite as soft. I unpacked the magenta, yellow, orange, turquoise, and black yarns, donned my sunglasses and Kevlar gloves, and knit two rows (actually I knit one row and purled one row) of the convoluted, confusing directions painstakingly deciphered from the blurry scan of tightly packed, faint type. Whoops. I am instructed to attach C, then knit some rows with D and F. Except why did I attach C? Removes sunglasses and gloves, emails the designer. Replaces project into lightproof bag and stuffs into closet. Moving on to the Alternate Project of the Day, I unpacked the printer I was asked to review for a World Famous Techie Magazine. Too bad paper and ink cartridges were not supplied. Poked at the buttons for a few minutes and discovered that the printer has the unfortunate feature of Speech. Does anyone want a talking printer? After listening for a few minutes (Hi! My name is Phil and I'll be your printer today! ), I resisted the urge to shoot the little elecronic creep in the USB port and began the Alternate Alternate Project of the Day. Fortunately, this project actually went quite smoothly after the initial cast-ons, which featured long tails that were too short. I see from the pattern that I need 200 yards of yarn. I have 198 yards. What are the odds of having enough yarn for the last row? Find out next time, because I am afraid to fire up the camera. It can talk to the printer.